KTKT published charts on a weekly basis during 1965. The 1965 charts were of the same style and design as the 1964 charts for the first four issues of the year. Starting with the January 29 1965 edition a new style and design was introduced. Previously the charts were printed on a piece of paper measuring 8 1/2 inches wide and 7 inches long and folded in half length wise to form a small four page brochure. The new design was about half this size – a single piece of paper measuring about four inches wide and six inches long. A different color of paper was still used each week alternating between blue, green, yellow and a pale tan color. One side of the new styled chart had all of the front cover information - KTKT logo across the top - KTKT DJ’s – called the Swinging Seven – pictured and listed inside a large drawing of the number seven. KTKT still proudly proclaimed its position of being rated number one in Tucson by C E Hooper but Pulse was no longer mentioned. When flipped over the other side of the chart displayed the weekly top 40 tunes and the daily titles for the “Album Sound Of The Day” as supplied by Johnny Barker’s Record Counter. Using a greatly reduced font the top 40 songs are now listed in one column. The weekly KTKT charts continued to debut on the air at 1030 Saturday morning and run until midnight the following Friday. The DJ line up pictured on the front side started 1965 with the same as when1964 ended with the first change taking place on the issue dated June 18 1965 when the picture of Dan Gates was added in the 9 to Noon spot. 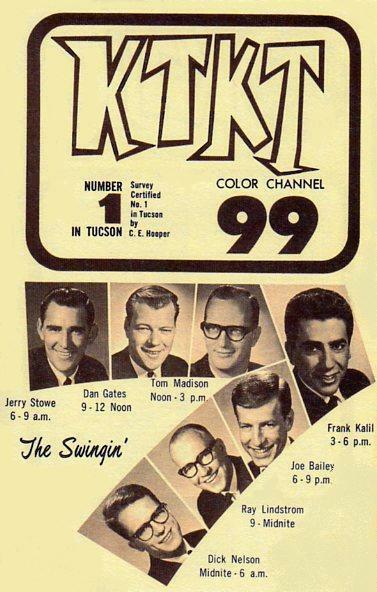 No other DJ picture changes would occur on the charts during 1965 until the issue of November 5 when Marshall Darris’ picture takes the place of Ray Lindstrom who left KTKT for sister station KRUX Phoenix. Music wise during 1965 the British Invasion acts continued their success catching as many as 13 KTKT chart positions on the first chart of the year. By summer of 1965 the American response began in earnest when the Byrds debuted on the KTKT chart on June 4 with Mr. Tambourine Man – a song that sparked the folk – rock boom of 1965 -1966. Soon other American acts –such as Sonny & Cher, the Beau Brummels and an electrified Bob Dylan would also assault the charts of 1965. American chart veterans such as the Four Seasons and Beach Boys would also continue to enjoy chart success. Garage bands began to spring up across America as many young fellows would try to emulate the Beatles success. 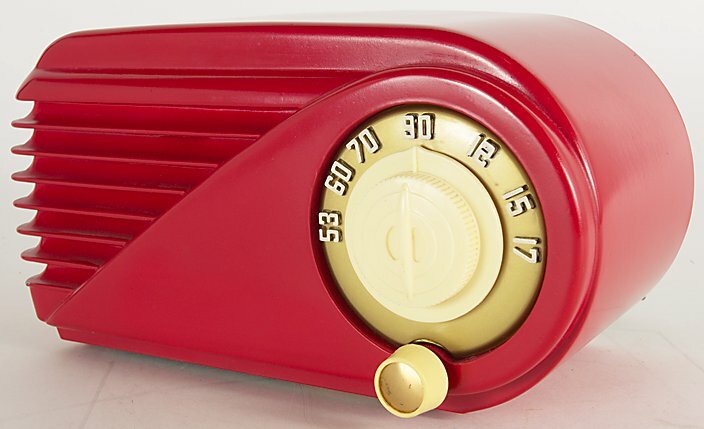 Groups such as The Gestures from the upper Midwest, Cannibal &The Headhunters from east LA and Tucson’s own Travelers would also chart on KTKT during 1965. This spark would lead to a garage band explosion on the charts during 1966. Another big force in American that started to shine brightly during 1965 seen often on the KTKT1965 charts would be acts on Detroit’s Motown label. In terms of weekly chart positions Motown would often rank number two behind only the British Invasion acts. See the first chart of the year to count five positions held by Motown artists. Once again a big thank you to my friend Jim Chrisman for having the wisdom to keep his KTKT chart collection all of these years. Many of these 1965 chart images are from original KTKT charts in Jim’s collection. The KTKT chart image from October 8 1965 is from an original chart courtesy of web master Ray Lindstrom. The chart image for January 8 1965 reads “1964” in error. The chart image showing for the date of July 26 1965 is wrong – the date on that chart should read July 23 1965. As in prior years KTKT does not list the weekly pick hit on the charts because by the time the DJ’s met Thursday evenings to select the upcoming pick hit to debut on the following Saturday the new charts - which also debuted on Saturday – would have been already sent to printer. The small font coupled with less than stellar scan copies make the song data hard to read on a couple of the charts. The January 29 issue may be the most difficult to read. 1965 is less than complete with 15 weeks missing so far. The KTKT charts are complete through the month of June. All the missing charts are from the later half of the year. To view a slide show of the charts from 1965, click on the button below. As it appears, you can stop, start, fast forward, or go back by using the controls at the bottom of the page.